Although private road residents had strongly sought a task force to examine how the issue of private roads in Orinda could be addressed, and although the Citizens Infrastructure Oversight Committee had made recommendations about the composition and role of a task force on private roads, the Orinda City Council on July 10 shut down the idea of a task force, preferring not to spend money on a task force to address an issue the council considers too expensive to fix. The single council member to support the task force was Darlene Gee, a transportation engineer. Council Member Eve Phillips recused herself, having recently purchased a home on a private street in the Roads of Hacienda area. It has been clear that city staff opposed the idea of the task force. When Public Works Director Larry Theis presented the idea?to the CIOC, he began by saying?that although it was asked to?consider the task force, it did not have to recommend one. City Manager Steve Salomon made it clear, too, that Theis was not alone in his views, but was strongly backed by Salomon, who worked with Theis on the report, which, he admitted, was difficult to write. "I don't want Larry to bear the brunt of this," Salomon said. "We both feel very strongly." Theis presented the staff report to the council, and stated that staff recommend that the task force not be created. Just the task force alone, and not the work that might result from the task force, was estimated to cost the city $90,000 for nine months, Theis told the council. Salomon said that the number of miles of private streets in California has increased over time. Cities are strapped for cash, he said. Salomon addressed arguments that it isn't fair that some streets are maintained by the city and others are not. "There is nothing fair about taxes," he concluded. Salomon focused on the risk associated with private streets, risks that would be assumed by the city if it accepted the roads as public. It isn't just the cost of maintaining the roads, Salomon explained, but this risk of claims and litigation. Even now, the majority of the claims and litigation faced by the city arise from things that happen on the streets, he said. The acceptance of private streets would be a huge risk for the city, according to Salomon. "Once you start going down that path, it is a huge risk to the finances of the community," he said, adding, "There was adequate notification when the properties were purchased." Public speakers came prepared to address the recommendations of the CIOC; their comments focused on the issues in the CIOC recommendations. Contacted after the meeting, private street advocate Steve Cohn said that the group was shocked by the turn of events. Robert Hubner, a member of the CIOC addressed the council as a private citizen. "We all live on either a private or a public road," he said, "but we all have an interest." He asked that the facilitator recommended by the CIOC be a non-affected person. Joel Libove said that roads that are in excellent condition should become public roads. He noted that private road residents face additional problems, for example, Contra Costa County refused to deal with a vicious animal because the location was on a private street. Cohn said that Orinda has raised $55 million to fix public roads, and now it is time to take care of private roads. He noted that some 20 percent of Orinda residents live on private streets. Melissa Roeder said that private street residents have a wealth of data to share. "We don't want to be vulnerable to catastrophes," she said. "The city had no money before" to repair public roads, "and it raised it," she added. Beth Eliasm argued, "I'm told I'm a second class citizen," adding that she didn't understand what she was buying when she purchased her home. Madelyn Mallory envisioned the task force as a feasibility study. For example, she said, Orinda could use transfer taxes to fund private roads. Gee said that Orinda is unique in that it didn't incorporate until 1985, and she opined that 20 percent private roads is high. "Twenty percent of residents is a huge part of our community," she said. 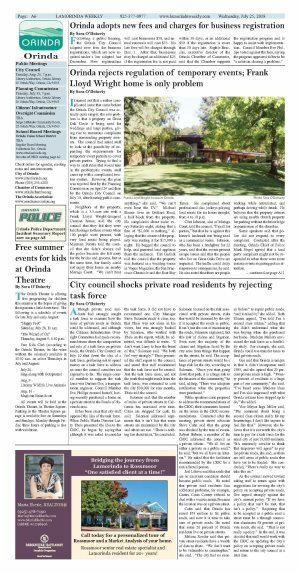 "I've heard some fabulous ideas and I'm also impressed with what Orinda citizens have stepped up to do," she added. Vice Mayor Inga Miller said, "The comment about being a second class citizen really hit my heartstrings; I don't like anyone to feel like that." However, she believes that it is not worth the city's time to pay for a task force for the small city of just 19,000 residents. "It's extremely cavalier to think that taxpayers will agree" to pay for private roads, she said, as there are still areas of public roads that have yet to be funded. She concluded, "There's really no way to take this on." As the council moved toward asking staff to return again with suggestions for revising the city's policy on accepting private roads, Gee argued strongly against the city's current policy. "If we have a policy that can't be met, that isn't a policy." Requiring that to be accepted as a public road a street must be a through connection eliminates 98 percent of private roads, she said. "That is not really a policy." In the end, it was decided that staff would work with the CIOC on updating the city's policy on accepting private roads and return to the city council at a later date.